Transform your organization by turning set-backs and barriers into opportunities – then solutions! How do you navigate forward, deal with constant wind shifts, sudden storms, conquer fear, isolation, while dealing with an ever present changing world? Neal Petersen takes audiences on a captivating journey around the world, using his remarkable life-story and shows, by example, that you can achieve your goals by turning set-backs and barriers into opportunities ~ with the right attitude and ability to foster innovation, build stronger teams, adapt under pressure, and cultivate a mind-set that focuses on no barriers ~ only solutions! World-class, history-making extreme adventurer, Neal Petersen completed two amazing journeys in his life: a single-handed yacht race around the world, 27,000 miles, 9 months at sea, alone, around Cape Horn, and in the smallest, least funded, boat he designed and built himself. And an even more arduous and eventful trip of overcoming racial prejudice during the harsh Apartheid era in South Africa, poverty, and a childhood physical disability, just to make it to the start line! Neal inspires organizations to foster innovation, build stronger teams, adapt under pressure, and cultivate a mind-set that focuses on solutions! Petersen brilliantly connects his remarkable story to audience’s unique challenges, a theme or vision with dramatic stories of adversity, sheer determination and triumph. His presentations redefine courage and human potential. With high energy and fully engaging presentation style, Neal captures audience’s attention from the moment he walks onstage, until he departs – leaving them with a fresh perspective on turning disadvantages into advantages. 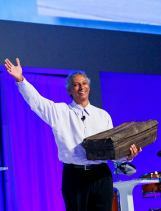 Neal carries a treasure chest on stage, and in it symbols of how he reached his dream by always turning barriers into opportunities, then into solutions. Using examples of how he overcame insurmountable barriers is compelling and highly entertaining. Neal demonstrates how success is realized—through innovation, balancing risk against return and being flexible enough to adapt to constant shifting winds. In these challenging times of uncertainly, fear and insecurity, many feel like solo sailors, adrift, grasping for survival. Neal lays out the importance of a clearly communicated vision, followed by detailed planning, preparation, passion and then execution. He has challenged global audiences to prevail against their own formidable barriers and setbacks while igniting passion and a mind-set to never give-up! Neal projects stunning images during his keynote and a 1 ½ minute intro and a 4 minute powerful self-filmed video of Neal rounding Cape Horn solo – his dream! He has thunder built into his presentation – lightning and fog are easy options for larger productions, dramatically bringing his story to life. Faced with huge challenges and rapid changes in today’s world, it’s easy to get bogged down in the negativity and uncharted waters. Striving for goals and success helps us to remain positive and to remember what’s really important. "There are No Barriers ~ Only Solutions!" In these challenging times of uncertainty, fear and insecurity rise, many feel like solo sailors, adrift, grasping for survival. Neal lays out the importance of a clearly communicated vision and direction, followed by detailed planning, preparation, passion and execution using his riveting personal story. Neal's life-story addresses adversity, diversity, leadership, team work, motivation, crisis, innovation, change, planning & preparation, focus - then execution and the courage to embrace fears. Neal’s keynote is a powerful multi-sensory experience using a treasure chest with symbols of turning barriers into solutions and for larger productions thunder, lightning and fog. US fees are inclusive of travel -clients know all costs upfront. Neal’s impact continues off stage, he remains is engaged with audience members attending social activities, book-signing, one-on-one conversations, group activities adding value for investment. Having visited over 100 countries and lived in 5, Neal appeals to diverse audiences. Neal is sure to give your event the WOW it needs. His passion and uniquely delivered life-story are the perfect open or close. Audiences are quickly riveted and remain so until he exits. Neal can drive home any message seamlessly and will leave your audience refocused and reenergized. Neal has always defined himself by what he can imagine – rather than how others would define him and how he sustained his dream in the face of numerous barriers is compelling. Overcoming fear and facing danger and the unknown has been central to how Neal approaches his goals and his life. Neal’s impact transcends age, gender, and race to promote the creation of leaders, life-long learners, and individuals who are mindful of the consequences their choices will have on personal, familial, community, and generational levels. His keynote provides validity for direct correlations between perseverance, determination, motivation, and dedication to achieve any goal. Audiences will understand that you have to address the possibility of failure if one wants to achieve great things. His message will connect with audience members’ experience facing challenges – sales quotas for instance – that may seem formidable at first – until imagination, innovation and passion are applied. Neal Petersen was born physically disabled and impoverished in apartheid-era South Africa, but was introduced to healing and equality in the waters surrounding Cape Town. Journey of a Hope Merchant recounts the epic journey that took this misfit kid from a racially segregated, working class neighborhood to the prestigious world of solo yacht racing.